As the leader of the Avengers, Dr. Hank Pym is Ant-Man! Ant-Man blends brilliant battlefield strategies with a guide-by-example bravery to unite Earth's mightiest heroes against the forces of evil. The symbol on his chest means Ant-Man will always heed the call, "Avengers Assemble!" Contribute pictures, update details or suggest corrections for Ant-Man. Write a review about Ant-Man. 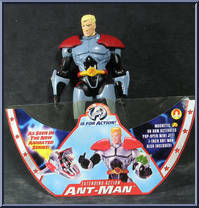 One of the few Hank Pym figures that covers both the Ant-Man and Giant-Man identities. Sure, Giant-Man looks more stretched than giant, but I stil find it a clever way to make a play feature based on Hank's powers. If you ask me, this is one of the coolest Antmans ever made.